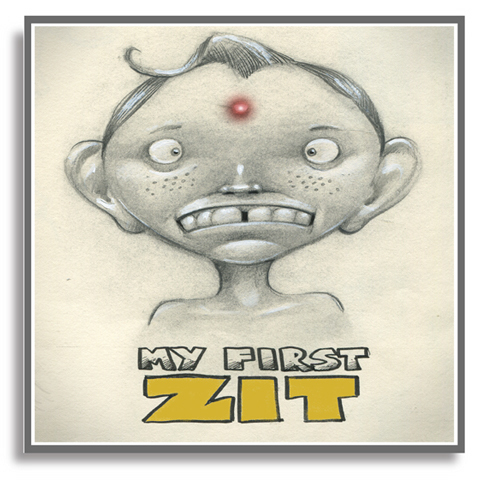 I think that is exactly where my first zit appeared! Something in the middle of the night is soon to follow! "Paul Twitchell: The Early Years"
It's a REALLY obscure joke, but any search engine should reveal a higher plane of knowledge. Chapter One: "To pop or not to pop - that is the question." Chapter Two: "Clearasil - help or hoax?" Chapter Three: "Debunking the chocolate-french fry connection." Chapter Four: "Bangs, baseball caps, and other forehead-covering techniques." OK everyone, duck and cover! This page contains a single entry from the blog posted on September 25, 2011 6:02 PM. The next post in this blog is Illustration Friday Entry: FEROCIOUS.